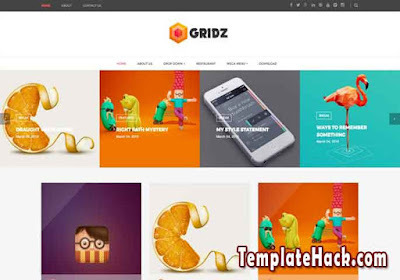 TemplateHack.com - Download Gridz premium blogger template. Gridz is best flat design blogger template and suitable for download niche blogger template such as download wallpaper, games, application, android, software, also blogspot template. Gridz don’t have any sidebar, but this SEO friendly blogger template has clean and minimalist design on the homepage. It is clean and simple blogspot template with new style to make your blog look uniquely. Breadcrumbs, Browser Compatibility, Drop Down Menu, Fast Loading, Featured Post, HTML5 Valid, Mobile Friendly, Page Navigation Menu, Post Thumbnails, Responsive, SEO Friendly, Social Bookmark Ready, Social Share Button, Minimalist, Simple, No Sidebar, dark, white, 3 Columns, 1 Column Footer. Anime blogger template, Download blogger template, Entertainment blogger template, Gadget blogger template, Games blogger template, Gallery blogger template, Magazine blogger template, Movie blogger template, OOTD blogger template, Personal blogger template, Photo blogger template, Photography blogger template, Portal blogger template, Recipes blogger template, Reviews blogger template, Tech blogger template, Travel blogger template, Technology blogger template.